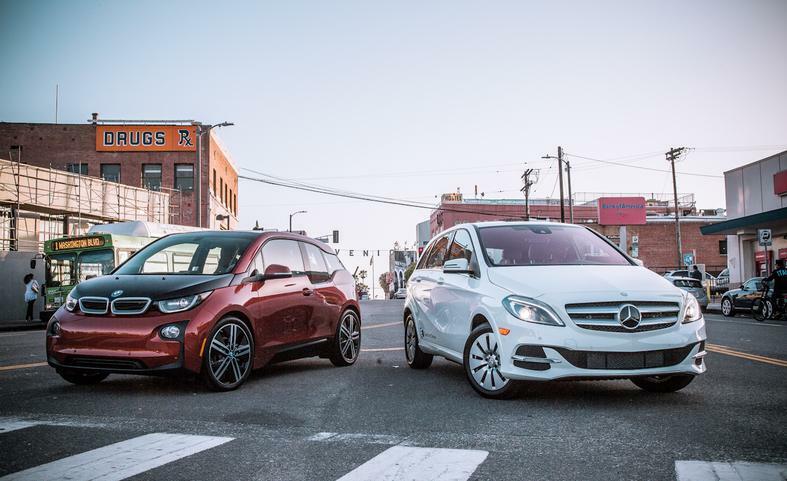 The strong competition between Mercedes-Benz and BMW has another chapter: B-Class Electric Drive vs. BMW i3, in some very interesting comparison tests conducted in US by Car&Driver and Clean Technica. The electric cars are very important for the clients who are very aware of the eco-challenges that we face because of the pollution. And the high levels of transportation pollution in cities and towns is something we should not ignore. 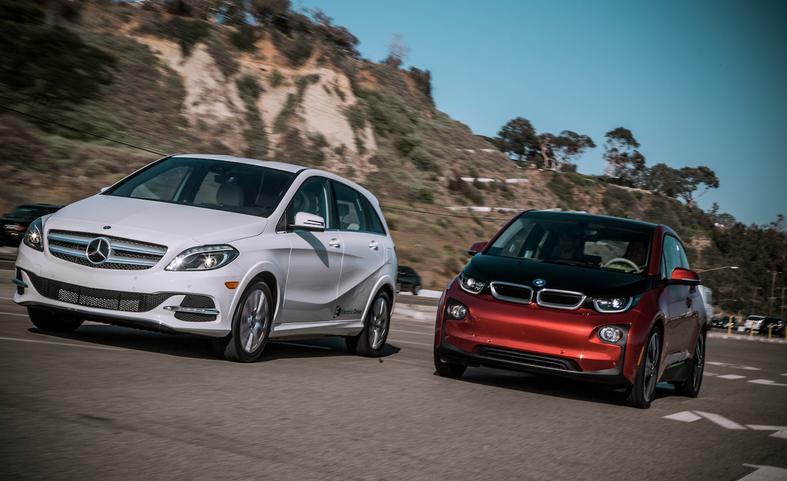 Now we have two adverse opinions on two of the hottest electric cars for familys in US: the 2014 Mercedes-Benz B-Class Electric Drive and the BMW i3. Well, there’s almost nothing to compare in this area, because the B-Class Electric Drive looks like a conventional-engined B-Class, while the i3 is something that definitely draws more attention than a Veyron – or, in Car&Driver’s words, “a moon buggy”. The B-Class (which is available only as an electric car in some US states) is longer than i3 by 15 inches, but don’t be fooled by the photos: the BMW i3 is the one a little bit higher, by less than one inch. Then there’s another striking difference: the wheels of i3 are bigger (20 inches! ), but they look comical skinny (which in turn helps with the low-friction, so less consumption). To summarize, Mercedes wanted an understated high-end battery-electric car that doesn’t scream about its green credentials. While BMW thought more appropiate to stir things in a way that it’s clearly an ecological statement. It’s not something to blame, of course, but as Clean Technica points, electric cars shouldn’t be seen out of the ordinary – so the B-Class Electric Drive could attract more easily prospective buyers. First of all, the B-Class Electric Drive is bigger, so it’s got clear advantages in terms of space for up to 5 passengers (i3 is designed for 4 passengers). Moreover, the suicide doors in the i3 don’t offer an easy way to get into the car, especially in the back, so B-Class Electric Drive gains much more points in this area. There’s also a 5 inches advantage for the B-Class’ wheelbase, which means more legroom in the back. Then is the boot: 17.7 cubic feet for the B-Class and only 9.18 cubic feet for the i3. You do the math and then think about the 51 cubic feet of cargo space in the B-Class when the rear seat is flipped down. All of these means a huge advantage for the Mercedes-Benz EV in terms of versatility and space, which matters the most for families. What about the driver cockpit? Well, there are huge differencies here also, because the B-Class has nothing out of the ordinary (it’s almost the same dashboard as in an CLA or GLA, but the i3 is very gadget-maniacs oriented: two large nice-coloured displays, a very organised and airy interior, and also more interesting recycled materials and choice of colours. In other words, the B-Class is a normal car, while in an i3 you feel like an architect, artist, musician, any kind of person that appreciates different approach. So, in the end, you have to choose: do you NEED more space or do you WANT an exciting interior? Both Car&Driver and Clean Technica agree that the first choice is the more logical one, so the B-Class Electric Drive has a big advantage over i3 in this area. First of all, it’s easier for a first-time driver to accomodate behind the wheel of the B-Class, because all of the commands look so familiar. Within the i3, there’s an awkard shifting pod behind the wheel, that requires quite a long time to understand, then you should take some time to browse the informations on both the displays. But, after a while, the i3 becomes user-friendly. Then it’s all these technical differences, starting with the front-wheel drive B-Class and the sandwich structure of the bottom, where the batteries are placed – by the way, all the electric and electronics are provided by Tesla, the halo car-company for all electric cars enthusiasts. 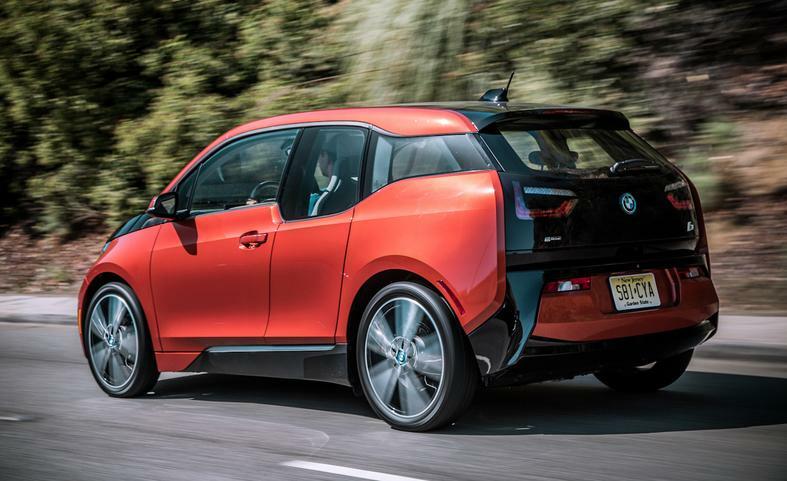 The i3 is a rear-wheel drive, like a proper BMW, which means that it’s got a more agile steering and promises better performances and handling. Well, test-driving the i3 makes you think twice about that “proper BMW” phrase, but nevertheless, as Car&Driver suggests, the i3 is more fun to drive than the B-Class Electric Drive. The BMW EV it’s simply lighter, more dinamically tuned and more manoeuvrable than the temperate B-Class Electric Drive. 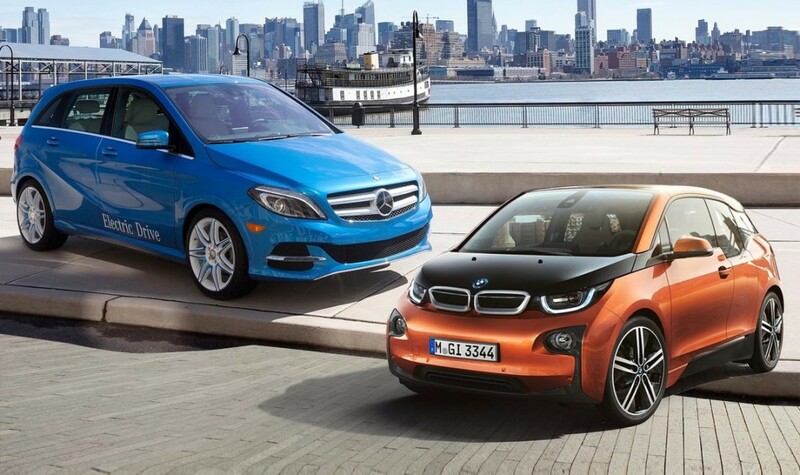 Which could come as a surprise for those who live by the numbers, because the two electroc motors have almost the same output: 170 HP and a maximum torque of 184 lb-ft for BMW i3, and 177 HP and a better maximum torque of 251 lb-ft for Mercedes-Benz B-Class Electric Drive. So, why is better the i3 on the road? The main explanation is the 1.000 pounds lower weight of the BMW i3, thanks to the intensive use of CFRP (Carbon-Fiber Reinforced Polymer), which means the i3 has a lb/HP ratio of only 16.8, much lower than the B-Class’ 22.2. The Mercedes-Benz EV is simply using the same body of a normal B-Class, in order to keep costs as low as possible. So, in the end, Car&Driver thinks that only the confort is better in a B-Class Electric Drive than in a BMW i3, while the bavarian has all the glory in terms of driving thrills. Which is good if you’re single and like to drive fast, even in city, but not much an advantage if you’re riding with your family. The Samsung/BMW battery in the i3 has a 22 kWh capacity, while the Panasonic/Tesla battery in the B-Class has a superior capacity of 36 kWh. But, once again, the heavier B-Class is surpassed by the i3, which has a better EPA milage: 138 MGe in the city, while the Mercedes-Benz is rated only 85 MPGe. 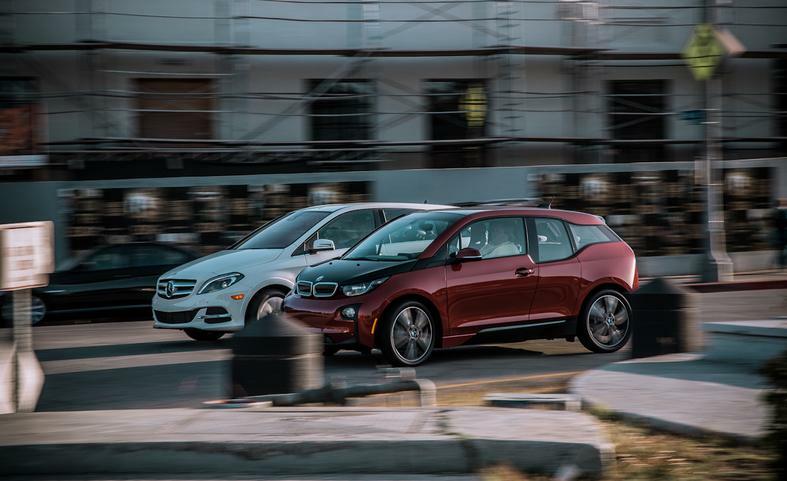 The difference continues on the highway, with 111 MPGe for the BMW i3 and 83 MPGe for the B-Class Electric Drive. The Car&Driver test-route revealed in the end a real-life range of 123 MPGe for the BMW i3 and 97 MPGe for the B-Class Electric Drive. Furthermore, on most 240-volt chargers, the larger battery in the Mercedes-Benz EV will take an extra hour or two to replenish, while the i3’s battery needs roughly 6 to 8 hours. So the clear verdict is that i3 has a better milage than the B-Class Electric Drive. But, in fact, both cars prove to be ok for the daily commuter, because the real-life range is a good 100 miles – well, the B-Class requires a more carefully driving style if you want a better mileage, which should be easy because it’s more calm than the i3. 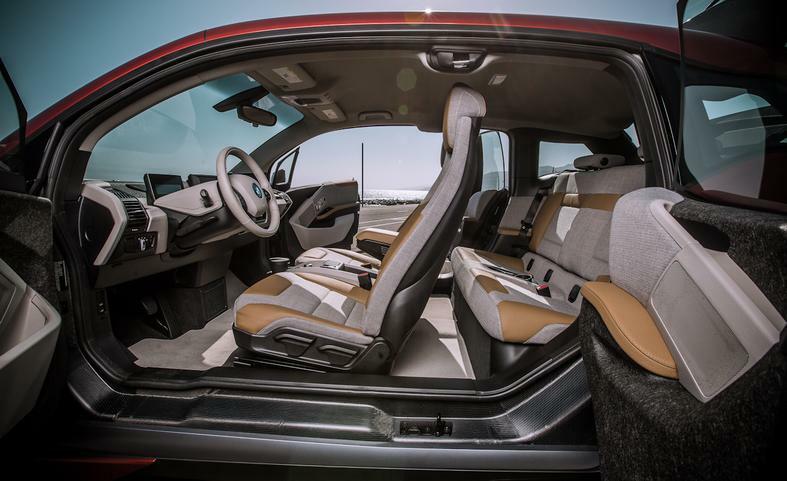 We’ve seen that BMW i3 has a much more daring exerior design and interior layout, is more performant than it’s rival and even more efficient (it’s lighter, so the milage is better). 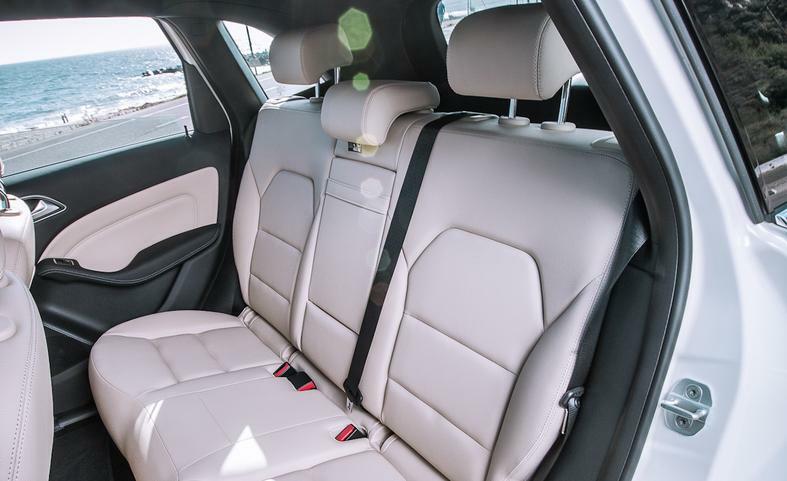 Meanwhile, the B-Class is more spacious and practical and offers more confort, so it’s a more appropiate car for the needs of a family (except the very long journeys). So, which one is more affordable? The answer is the BMW i3. But only by a mere $100, which is less than 1% from the base-price of more then $42.000 for each of the car. But then it’s the long list of optional equipments (longer and more diverse in the i3), which can easily raise the price over the $50.000 barrier for both cars. So they are both pretty expensive cars, but don’t forget they are 100% green cars – so you have incentives and don’t pollute while driving. The Car&Driver folks consider the i3 to be the winner (206 points versus 198 points, from a total of 240), mainly because of the better dynamics, not because of the slightly better mileage. 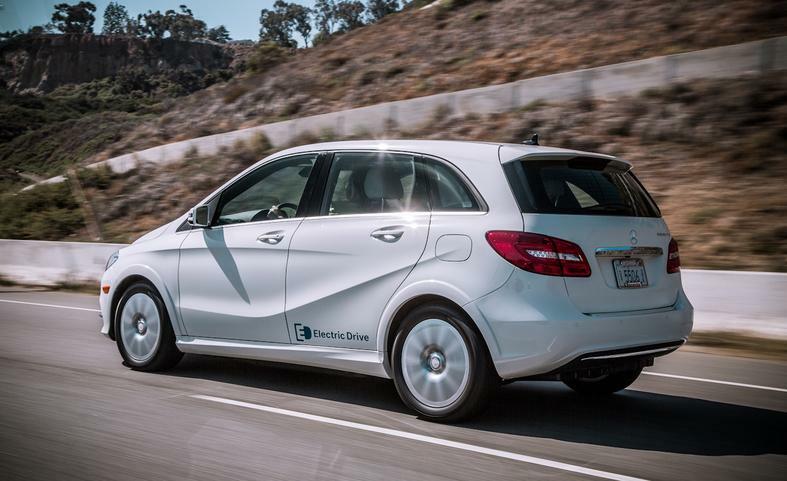 The Clean Technica, on the other hand, is much fond on the more practical B-Class Electric Drive, highlighting many aspects that the families are prioritizing. So, in the end, Mercedesblog.com thinks that we have two winners, because they target such a different public, but with one very important common feature: all of the clients understand why the electric cars are important. Who or what is Daimler?